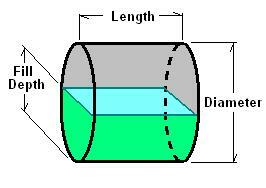 Enter Diameter, Length, Depth (with units) and desired output unit for volume. Press [Calculate] key and the resulting total volume, filled volume and fill ratio will be calculated and presented in the desired output unit. Examples of units include: "in", "ft", "mm", "cm", "m", "yd", "mil", and any length unit identified in the Complex Converter. Examples of volume units include "gal", "l", "in^3", "ft^3", "yd^3", "m^3", "acre*ft", "ft*yd^2", and any combination that results in a length raised to the 3rd power.